When did start running and when did you join Redway Runners? I started running in March 2011 when my best friend from childhood asked me if I wanted to run the NSPCC half-marathon that year. He is the only person who could have talked me into doing something like that! I joined Redway Runners in the middle of May 2016. I had just got back into running after preferring cycling for a couple of years. 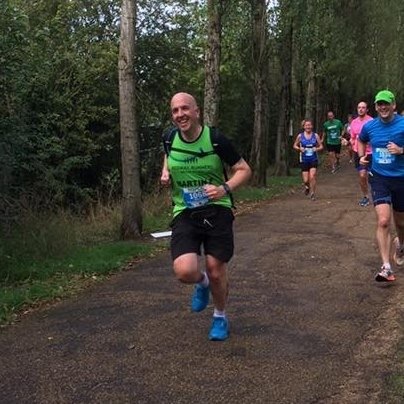 I ran the Milton Keynes Half-Marathon a couple of weeks earlier and had a dreadful run, losing 25 minutes from my PB of the time. Steve Patey, David Rose, Ros Crawley and Glynis Wiles had all been nagging me to join and this seemed like the right time. How much does running with RR mean to you? Without sounding too corny, it has changed my life. Running has always been my main way of de-stressing, but I had had enough of running on my own. I had lost all motivation. I have met more people in the past year than I had done in the previous 24 years since moving to Milton Keynes. We are a big family and the care we give each other knows no boundaries. Through all the support I have received along the way, I have achieved an incredible amount in the past year and I feel so much stronger mentally. My wife Nicola is not a runner, but has been welcomed into the family by everyone she has met. It was the old Monday club run from DL. Helen Wiggins was signing people in, as Stuart was not there. Nathan Rutherford was the first person I met and I ran with Glynis Wiles. I also saw Paul Mizon, who was in my tutor group at school. When and who do you run with the club? I try to run whenever I can, but school commitments often dictate when I run. I am currently looking after a beginners group, so a lot of my running time is dedicated to them. Parkrun is an essential part of my week, as is the Sunday run. I do the Explorer Run whenever possible, knowing Tim brings cakes! What has been you best running achievement? Without question, it was running the Rock ‘n’ Roll Liverpool Marathon in May this year. I ran the very first MK Marathon in 2012 and people who ran that day will remember how awful the weather was. I had a torrid time that day and it shattered my confidence. 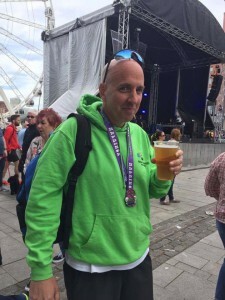 At Liverpool, I improved my marathon time by over an hour, so I could not be happier with how it went. Redway Runners helped me so much in achieving this goal. Probably in Italy, where my parents live. They live at altitude, so it is very challenging. I always get strange looks from the locals when they see me running up the hill to the next village! What do you love to see while running? I love to see other people smiling and achieving personal goals. With hindsight it was funny. On my very first Explorer Run a year ago, I slipped over into nettles and hurt myself quite badly. This was my introduction to Spencer, who carried out first aid on me. That evening I met Lucinda, Helen W, Pete & Kath Crawley for the first time. Tim often reminds me of that evening. What a welcome to the club!! F avourite running photo and why? Do you always round up? Of course! And I always add on a bit as Strava often chops a bit off! What do you think about when you run? I don’t do a lot of thinking, as I am always talking!! What cross training do you prefer? I do love road cycling and have done some big sportives, but I haven’t touched my road bike in nearly a year! Would you change your job if the hours didn’t suit running? That would be impossible being a teacher, though I don’t plan on being a teacher forever. I like the day time runs and do them as much as possible in school holidays. What was your favourite race and why? 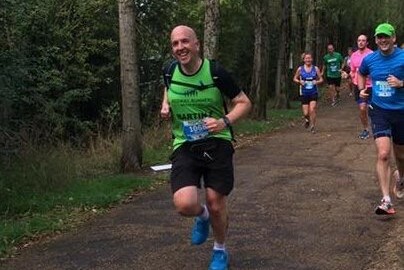 Apart from the Liverpool Marathon, I would say it was NSPCC Half-Marathon 2016, as it was my first as a Redway Runner. I ran it with Tim Giffen and he helped me go sub-2 hours for the first time. Favourite race distance and why? Probably half-marathon, as I have done 19 and it is a distance for which I feel comfortable training. If you could choose anywhere in the world to run, where would it be? I would love to run the New York Marathon one day. I have family there and my grandfather was there during the 20s. I have a real affection for the place. Though as a Londoner, my bucket list entry is to do the London Marathon one day. Milton Keynes will always be number one, but I also like Tring for the fact that it is a bit different! What would you prefer, a PB or a win? A PB without question, as running is a very personal thing. Plus, I will never win anything!!! Tell us about being a beginners’ run lead? I was approached by Annette and Jonathan, whilst I was a helper with the previous cohort. I had mentored my friend Gill Firmin to run her first half-marathon in March, so I agreed to have my own group. It has been hard work and a huge learning curve, but as they approach graduation (two already have! ), it has been incredible to see the progress they have made over the 10 weeks. The group gelled instantly and they have supported each other through thick and thin. I am very proud of all of them for what they have achieved. The helpers who have turned up week in, week out make all the difference. Of these, two names stand out. Steve Boothby and Sophie Phoenix have been with me throughout the journey and have stepped in when I have not been there. I would not have been able to do it without them. Your first bosom buddy was crafted in 1977—which makes us wonder (and cringe at) how women athletes even survived before then (athletic corsets both sound terrible and were a real thing). The first iteration of our treasured SPORTS BRA—brieﬂy known as the “jockbra” and later changed to “JogBra” by Hanes—was literally two jock straps sewn together for support. Today, the sports bra market is worth around $15 billion—so can you believe only 25,000 units were sold in its first year? An early edition of Yoga Journal in 1978 even claimed that eating only fresh fruit for three days leading up to race day was the best practice for “natural” fuel. Thankfully diet trends have evolved as much as fashion trends, and an appropriate protein-to-carb ratio is more fitting to fuel today’s runners. National Bowl – The venue opened in 1979, with gigs by Desmond Dekker and Geno Washington, In 1970 Dekker released “You Can Get It If You Really Want”, written by Jimmy Cliff, which reached No. 2 in the UK charts. 1970 First section of new city grid road system (H2 from V4 Watling Street). The Stables presents its first concert. 1970 Sir John Dankworth and Dame Cleo Laine found The Stables music organisation in the stable block of their home. 1971 First major housing scheme (Galley Hill, Stony Stratford). 1973 Bletchley Leisure Centre opened with its iconic pyramid building which housed the pool, later redeveloped. The Milton Keynes Museum was founded by volunteers as the Stacey Hill Society. 1974 Under the Local Government Act (1972), Milton Keynes District was formed by the merger of the urban districts of Bletchley, Newport Pagnell and Wolverton, Newport Pagnell Rural District and part of Wing Rural District. The district was awarded borough status in the same year. The Community Workshop in Galley Hill was opened. 1975 The first office building in Central Milton Keynes (Lloyds Court) opens. 1978 Liz Leyh creates the Concrete Cows at Stacey Hill Farm (now Milton Keynes Museum). Tim Martin opened his first pub in 1979, in Muswell Hill, north London. The J D Wetherspoon name comes from one of Martin’s teachers in New Zealand who could not control his class. “I decided to call it Wetherspoon’s after a former teacher – not because the teacher in question at my primary school in New Zealand had said I would never make it, as some people think, but because he was too nice a fellow to be running our particular class and he couldn’t control it. So I thought: I can’t control the pub, he couldn’t control the class, so I’ll name it after him.”The “JD” part of the name was named after Dr JD Watson, whom Tim Martin met on holiday in Castlerock, Northern Ireland. In 1970 he moved to Milton Keynes in north Buckinghamshire, at that stage little more than a line on a map, to be General Manager of Milton Keynes Development Corporation at the young age of 39. He oversaw the major growth of the ‘new city’ through to 1981. Thereafter, he joined up with Terence Conran (of Habitat fame) to establish the new architecture and planning consultancy Conran Roche. The company developed a number of successful projects during the 1980s including Butler’s Wharf and Michelin House in London. Ill health forced him to retire as managing director in 1988.A special ceremony took place on Friday, November 9 2012 to change the name of City Gardens to Fred Roche Gardens. The current local authority was first elected in 1973, a year before formally coming into its powers and prior to the creation of the District of Milton Keynes on 1 April 1974. The council gained borough status, entitling it to be known as Milton Keynes Borough Council and to annually appoint a Mayor of Milton Keynes. It was envisaged through the Local Government Act 1972 that Milton Keynes as a non-metropolitan district council would share power with the Buckinghamshire County Council. This arrangement lasted until 1997 when the district council gained responsibility for services that had been provided within Milton Keynes by the county council. 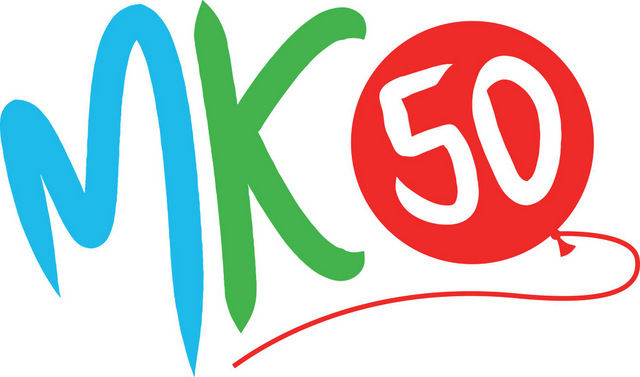 Since gaining county council functions the council has gone by the name Milton Keynes Council. In 1978 The moot mound of the Secklow Hundred was found, excavated and reconstructed, prior to it being overlain with the development of central Milton Keynes. It is on the highest point in the central area. “The Black Horse” a bronze sculpture by in 1978, is sited outside Lloyds Bank, echoing its iconic logo. Elizabeth Frink gained recognition in the early 1950s. She used animal and human forms to express the anguish of the post war period. Located at the heart of Milton Keynes, Campbell Park hosts many of Milton Keynes’ major festivals and events. Its imaginative mix of formal gardens, water features, woodland and open pasture, mean it’s an ideal spot to ramble through and enjoy the changing seasons. “Amazing Grace” is a Christian hymn published in 1779, with words written by the English poet and Anglican clergyman John Newton (1725–1807). Newton wrote the words from personal experience. He grew up without any particular religious conviction, but his life’s path was formed by a variety of twists and coincidences that were often put into motion by his recalcitrant insubordination. He was pressed (conscripted) into service in the Royal Navy, and after leaving the service, he became involved in the Atlantic slave trade. In 1748, a violent storm battered his vessel off the coast of County Donegal, Ireland, so severely that he called out to God for mercy, a moment that marked his spiritual conversion. He continued his slave trading career until 1754 or 1755, when he ended his seafaring altogether and began studying Christian theology. Ordained in the Church of England in 1764, Newton became curate of Olney, Buckinghamshire, where he began to write hymns with poet William Cowper. “Amazing Grace” was written to illustrate a sermon on New Year’s Day of 1773. It is unknown if there was any music accompanying the verses; it may have simply been chanted by the congregation. It debuted in print in 1779 in Newton and Cowper’s Olney Hymns but settled into relative obscurity in England. In the United States, however, “Amazing Grace” was used extensively during the Second Great Awakening in the early 19th century. It has been associated with more than 20 melodies, but in 1835 it was joined to a tune named “New Britain” to which it is most frequently sung today. South Willen Lake is the busiest park in the region, attracting more than one million visitors each year to take part in water sports, golf, high ropes, special events, or to jog, picnic, walk, play, or just watch everyone else! 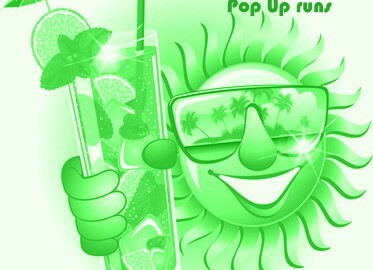 Expect a bit of fun on the run and then chance for a post run social, led by Martin, Jim and the Gold Jacket! Looking to get faster, or just feel more comfortable on your next 5k or Half Marathon? Always fancied trying out the track but never had the confidence? This session is for you. Track is not just for “fast runners”. Doing speed work sessions at the track will help any runner improve their race time and better their overall fitness. Dougs session will help enhance speed endurance and would include drills designed to increase speed, agility and strength. It is suitable for all abilities and compliment any run training. We’ll take on the off road trails and head to Puke Hill for a challenge. Woodland runs, meet at Bow Brickhill Church (top of steep hill with war memorial). Ready to go for 19:30. Parking is VERY Limited, so consider parking close by and walking in. Pub to finish. Run should be around 01:15hrs or so and will be steady paced. All club members are welcome to both runs. There will be loop backs where necessary, as no-one will be left. Woodland runs, meet at The Duke Inn, Woburn Road, Heath & Reach (10-mins south of MK on A5). Parking is very limited and is limited within the village, so please lift share where possible. Pub to finish. This year’s tour, the 35th, will start on Sunday 3 September with the Tattenhoe 11km and finish on Friday 8 September with the Willen Lake 6 and has six races over the six days. You will need to be a paid Redway Runner member and have ‘Redway Runners’ registered as your club in the entry list. 6 races over 6 days! Entries are open for this years event. A highlight of the year for runners, this relaxed and social event appeals to all entrants as it welcomes runners of all abilities and ages. Six races in six days: mixed terrain; short and long distances; Tears and laughter. Each race begins with the nervous warm-up and a scan of the previous days results. It does not matter how good or bad you are, there is always someone a few seconds in front or behind on the aggregated times and positions. Names that you have heard during the year, but not been able to put a face to, are introduced as “the one just behind you!”. The event is suitable for both the fastest and slowest of runners. Prizes: Everyone who completes the tour receives a technical T-shirt. 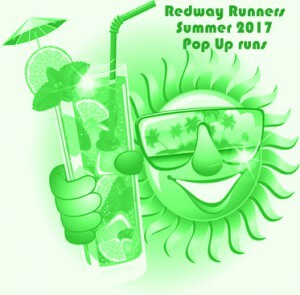 We will have several prizes available Redway Runners members( First Male / Female and most improved versus last year). Tour entry fee is £30 for non MMKAC members (£32 if not affiliated to English Athletics). We will continue to look at our runs and what we can offer, but this does rely on people who are willing to give up time and run to lead runs for the club, not just one week but every week. If you want to help let us know. The yearly Redway Runners Festival of Running took place this weekend at Caldecotte Lake. Runners completed up to four events across the weekend: a full marathon followed by a half marathon on Saturday, and a 10km followed by another half marathon on Sunday. With up to 55 runners in each race, just four completed all four near back to back events- Neville Rowles, Stephen Dunham, Rachel Elder and Paul Woodward. Conditions were very warm and windy. Martin Lawrence, club Chairman commented: ‘It was a fab green turnout for the second year of the Redway Runners Festival of Running with the four of events over the two days. It was very hot weather conditions over the weekend, four runners did all the events -58 miles. For Stephen it was the second time he had done all events making him the only ‘ever present’ person to do all eight of the events”.